Can Your Software Live in the Cloud? Because Nivio is still in by-invitation beta, with elements such as a native iPad app not ready in time for this article, it's a bit premature to develop a formal opinion on Nivio. An ambitious attempt to adapt Windows--and Windows applications--for mobile devices, Nivio could turn into a powerful service, but right now it's just too darn complicated to use. 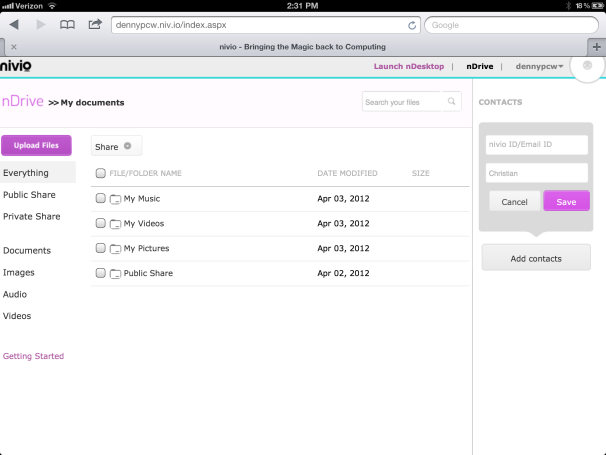 Even launching Nivio is a hassle. While the developers put the finishing touches on its iPad app (which I'm hoping will streamline the process), beta testers are directed to a third-party virtualization app, Wyse PocketCloud. Once you install it, however, you don't actually run it to use Nivio; rather, you open Safari and navigate to the Nivio website. (Nivio uses the Wyse technology behind the scenes to power its system.) Once you've logged in, Nivio brings you to a home page from which you can launch the Nivio Desktop app (which requires a second login). 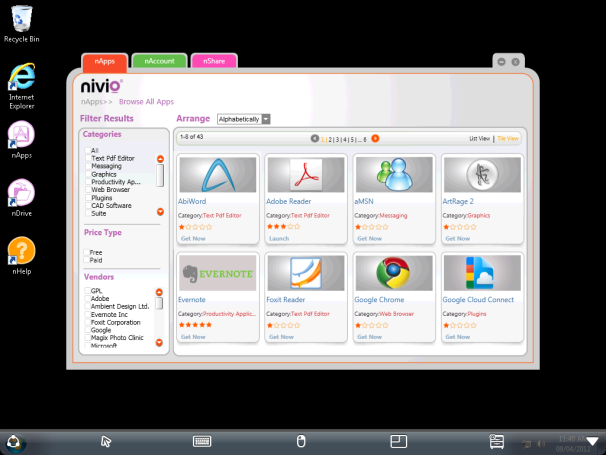 Once you finally see Nivio's Windows desktop, you still have to hunt for the Office apps: All that appears on the desktop are shortcuts to nDrive (Nivio's storage service), nApps (a store with virtualized versions of desktop apps), Internet Explorer, the Recycle Bin, and a shortcut to Nivio's online help desk. This Web page showing your Nivio files is one stop of many on the way to seeing its Windows desktop. At the bottom of the screen, Nivio has added its own taskbar, with half a dozen icons whose functions aren't particularly intuitive. One icon brings up a pop-up menu linking to a file browser, a desktop-snapshot utility, help, and a disconnect command. An arrow-shaped icon turns into a virtual mouse, which helps you pinpoint small icons on applications (a lot of Office Ribbon icons are pretty tiny). Another icon summons the virtual keyboard, a different one zooms in on an area of the screen, and still another one relates to PocketCloud Companion (which apparently relates to the Wyse technology). It's all very confusing, and none of it helped me access the Office applications. I finally found them listed in the folder you get when you tap the nApps icon; you can also reach them by tapping on an arrow at the right end of the Nivio taskbar, which brings up the familiar Windows Start button (which in turn lets you summon programs). But Nivio should consider simply putting shortcuts on the default desktop. Nivio's service offers access to virtualized versions of several dozen Windows applications and applets. Nivio's navigation tools (particularly the virtual mouse) are its concession to the problem of dealing with the Office Ribbon on a small screen, without a hardware mouse. Once you get used to the arrangement, it's a reasonable compromise, but I prefer CloudOn's decision to tinker with the Ribbon design in order to make icons large enough to use with a fingertip. Nivio's version of Internet Explorer worked well on static sites--I was able to play a Flash-based bridge game that I couldn't log in to in OnLive Desktop's version of IE. But Nivio engineers say they haven't gotten around to optimizing it for video, and the clips I saw did indeed look jerky. Admittedly, Nivio offers a larger selection of virtualized applications than the other cloud-based services I looked at; most notably it's the only one to offer the Microsoft Visio diagramming program. Because you can run Nivio on PCs as well as on mobile devices, accessing files on nDrive is easy regardless of what device you're working on. But price may become an issue, as Nivio will charge subscription fees for the applications you use, on top of a monthly fee for use of nDesktop, its virtualized version of Windows. For example, Office use will run $15 a month, while individual Office apps will go for $7.50 a month. The company is making 10GB of nDrive storage available for free to all comers, but you'll have to pay by the hour for using nDesktop. Individuals can pay $5 per month for 10 hours of nDesktop use or $15 a month for unlimited use. Until Nivio becomes simpler to use (and eliminates IE video problems), it's a tough sell at any price. But if it solves those problems, its growing application portfolio could make it attractive.